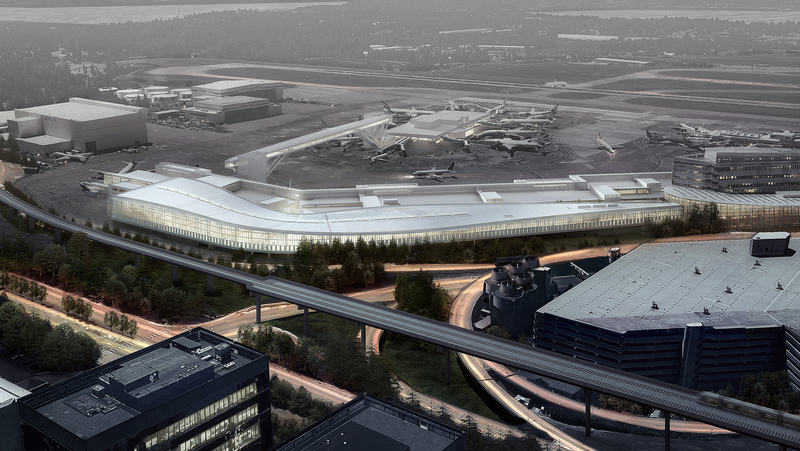 Welcome to the Seattle-Tacoma International Airport International Arrivals Facility (IAF) design build website. Here you can learn more about the Port of Seattle’s progressive design-build project and how you can join the team that is destined to make construction history here in Seattle and the Puget Sound region. Clark Construction has been selected as the design-builder for the IAF. This project is Clark Construction’s second major undertaking at Sea-Tac Airport with previous completion of the $280 million South Terminal Expansion in 2004. Clark will construct the 450,000 square-foot International Arrivals Facility Building on the east side of the A concourse. The existing Federal Inspections Area (commonly known as Customs) dates back to the 1970’s and is beyond its peak capacity with dramatic increase of international flights. The new IAF is expected to create a higher quality passenger experience, advance the Puget Sound region as a leading tourism and business gateway and serve the traveling public well into the future. The project team will also design and construct an “iconic” pedestrian walkway, which will span 900 linear feet over the existing taxi lane, connecting the south satellite to the IAF. The pedestrian walkway will be prefabricated offsite and installed within a seven-day time frame. When complete, the pedestrian walkway will offer views of Mount Rainier and the Olympic Mountains. In addition, the project will feature an elevated sterile corridor, raised nearly 32 feet above the apron level, and will house gates A3-A14. The design-build team consists of SOM and Miller Hull Partnership, architects; ARUP, MEP engineer; KPFF, structural engineer; MKA, civil engineer; and Schlaich Bergerman Partners, pedestrian walkway designer, among others. The project will be designed to achieve LEED® Silver Version 4 certification. Clark Construction is an Equal Opportunity Employer. Full Policy.